Both artificial slates and natural slates have to deal with moss and pollution in the long run. Small amounts of dirt are usually not a problem, as opposed to when large parts of the roof are covered with moss. This gives your roof an ugly look and it is bad for the state of the roof as well. By periodically removing moss and cleaning a slate roof, you can avoid problems and keep the roof in top shape. Curious about the cost of slate roof cleaning? Request online quotes from specialised roofers here. Why and when clean a slate roof? By removing moss from a slate roof, you improve the look of your house. The roof acts as a sort of business card for the house, as it already gives an impression of the rest of the house at the entrance. A well-maintained roof means a higher price in case of sale! In theory, mosses are not directly harmful to the roofing. At least, this holds true for lichens that do not occur in large numbers. In case of artificial slates, this moss type usually appears after 10 years. The protective layer of the roof is worn out at that time, as a result of which the slates have become porous and less smooth. The growth conditions for algae and mosses are perfect then, especially when the roof is partially shaded or if it is slowly dehydrating for some reason. In this phase one checks which sort of slates are used, and how they get cleaned best. 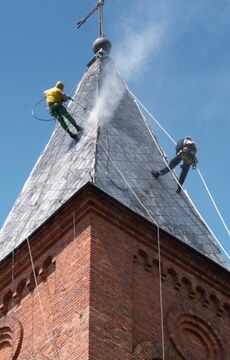 Natural slates demand for another cleaning technique than artificial slate roof tiles. One also takes a look at the underlying roof during the inspection, as this has to be entirely waterproof before the cleaning can get started. There is always a chance of water seeping in, so the inner roof has to avoid this. Also the connection with the roof gutter must be good. After the roof is inspected, the tools can be prepared and one can start cleaning. 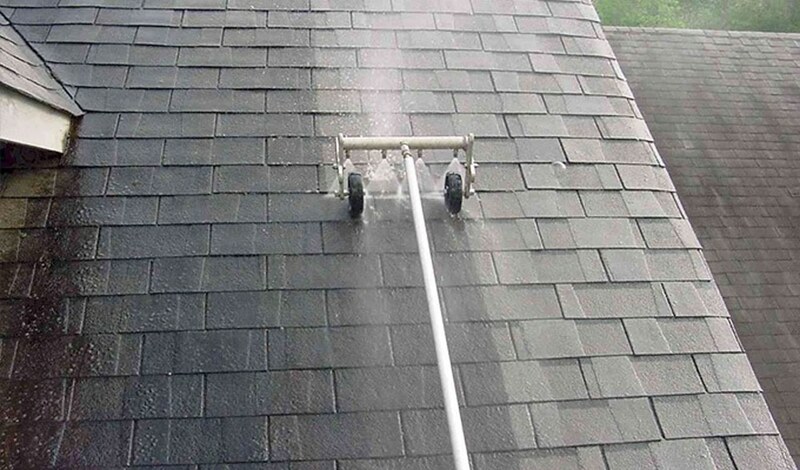 How the roof is cleaned depends on the degree of pollution and the type of slate. One can choose to first spray a (biological) cleaning agent onto the slates and let it soak for a while. As soon as the product is absorbed, the slates are cleaned with water jets. In doing so, the roofer makes use of special accessories that spray downwards. In this way, the water cannot go underneath the slates. Because of the force of the water, the moss on the slate roof tiles will get off easily and fall down. After all the mosses have been removed from the roof and the gutter has been cleaned, it is necessary to disinfect the slates. In this way, the last remaining (mould) spores are killed, and it prevents the mosses from growing again. When the roof is entirely cleaned, it is advisable to have it impregnated or coated. This is only necessary in the case of artificial slates. 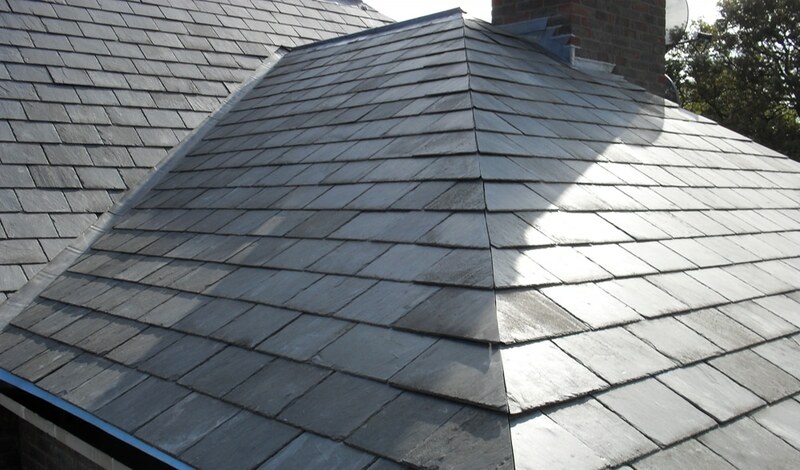 The protective topcoat of these slates has worn off over the years, and by treating the slates with an impregnating agent or coating the roof won’t become dirty gain. Which method you should choose, depends on the state of the slates and your personal preference. If the slates do not look too good anymore despite the cleaning, you can choose a coating in a specific colour. The roof then gets a completely renewed look. If this is not really necessary, you can also opt for a transparant coating or for a treatment with an impregnating agent. This agent completely absorbs into the slates and is no longer visible after application, although it maintains its protective function. After impregnating, the roof will be protected for fifteen to twenty years. Removing moss and also coating or impregnating a slate roof costs £25 to £43 per square metre on average. The price depends on the roof’s level of difficulty and the accessibility. In case of some roofs that are not walkable, it is required to use a scaffolding. This entails extra costs. Curious about the price of slate roof cleaning? Request informal quotations now from specialised cleaning companies via our online service. Click here for more information. Asbestos may no longer be used for the production of artificial slates. In the past, the use of asbestos in construction materials was considered normal. You can still encounter these slates on old houses. These slates with asbestos should not be cleaned! By cleaning, minuscule asbestos fibres could get loose and end up in the air. So you need to have these slates removed, which is – regarding the age of the roofing – better for the house anyway. During this renovation, you may as well do something about the insulation at the same time. 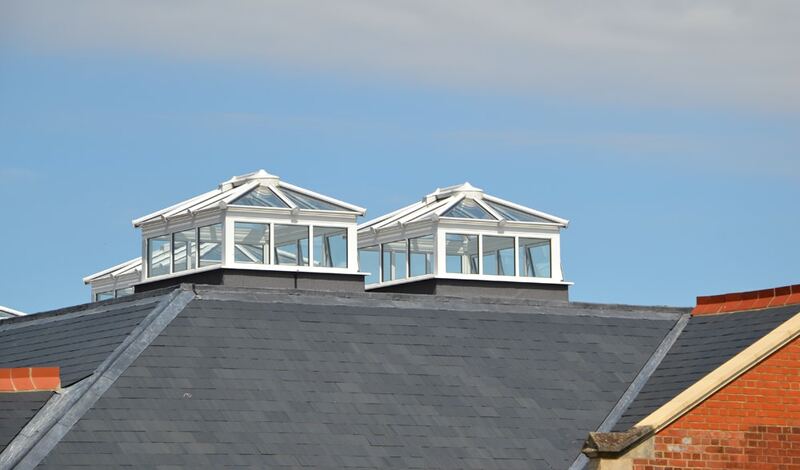 Tip: Always choose a coating for artificial slate roof tiles! The mosses that you see on artificial slates and concrete tiles, are mostly lichens. Actually these are not plants like the other kinds of moss, but fungi that grow in symbiosis with algae. They grow well on alkaline stony substrates and do not stick too deep into the surface. This moss type can secrete acids that cause harm to the substrate. Most of the time, this concerns a shallow damage. This is also the reason why the roof must be coated again after cleaning.